Upon entering office, I was surprised to learn state law required my office to hold billions of dollars within the Economic Stabilization Fund (ESF) in a manner no prudent individual or business would use with their own money. We couldn’t even earn enough interest to keep pace with inflation. In short, it was like burying the money in a hole on the Capitol lawn. Last session, the Legislature took a great first step toward remedying this problem by giving my office the flexibility to invest a portion of the ESF to earn enough to cover inflation. Let’s step back to 1987 when Texas was facing an oil bust and the Legislature was struggling with a massive budget shortfall. That year, the Legislature passed a constitutional amendment to create the ESF, which was to serve as a savings account, or a rainy day fund, for future downturns in the state’s economy. It is ironic that the ESF is funded by oil and gas severance taxes, given it was created in a time when the glory days of Texas oil and gas were quickly disappearing. For nearly two decades, the ESF had little money. Then, like a phoenix rising from the ashes, technological advances in the oil industry unleashed a boom in Texas. The ESF went from a savings account in name only to its current level of $10.2 billion — reigning as the largest state government savings account in our nation. Today, Texas is home to 50 percent of all operating oil rigs in the United States and we are blessed to have a sizeable ESF balance. Moreover, oil companies are making significant investments in the state and the general consensus is that the industry will be alive and active for decades to come. As with any commodity, oil prices are extremely volatile and projecting revenues based on those prices will always be difficult; however, Texas will likely see billions of dollars flowing into the ESF for decades. With this set of facts and as custodian of our ESF, I have spent the last several months working to formulate a more deliberate, two-tiered approach to managing the ESF. First, we must maintain the original intent of the ESF: To ensure the Legislature has the funds on hand necessary to deal with declines in revenues when Texas is hit with economic downturns. To do so, I propose the Legislature require us to maintain an ESF balance equal to 8 percent of general revenue spending, which is in keeping with current credit rating agency standards. This will enable the ESF reserve balance to grow as the state’s budget grows, maintaining a healthy reserve for adequate protection against the next economic downturn or rainy day. This first tier of the ESF also should be managed — invested — so that the purchasing power of the money is protected against rising inflation. Secondly, I’d like to create a Texas Legacy Fund within the ESF to operate as a permanent endowment. 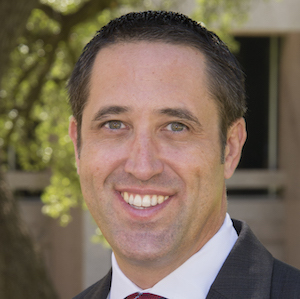 As long as tier one of the ESF contains the 8 percent reserve balance, any new dollars would flow into the Texas Legacy Fund tier. 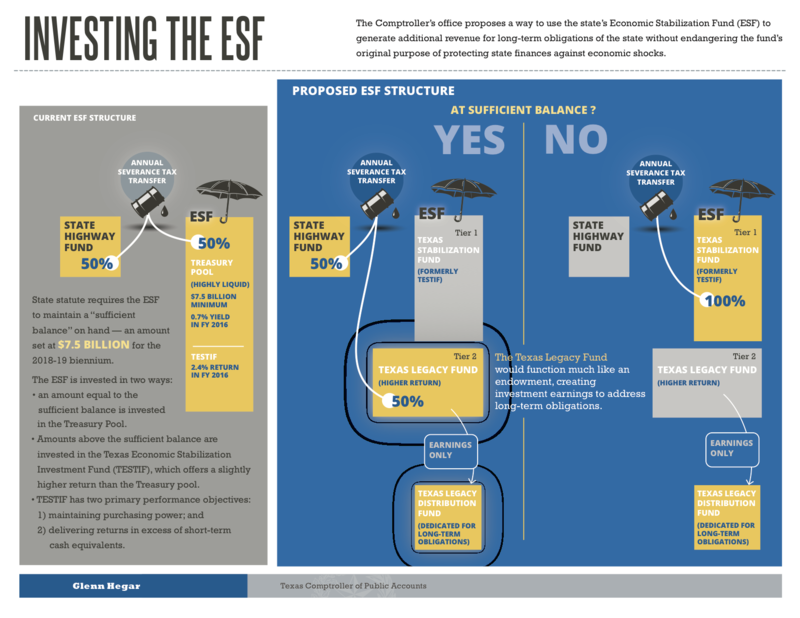 The purpose of this tier is two-fold: it will operate to achieve a higher rate of return so the ESF is growing over time, and simultaneously provide a new revenue stream in the form of annual earnings disbursements specifically dedicated to address the long-term balance sheet needs of our state. As Texans, we have a unique mix of pride and humility. 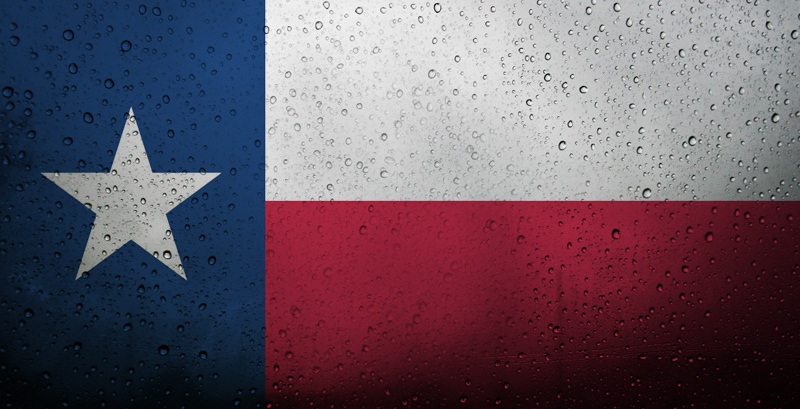 As a prideful bunch, we relish the opportunity to remind anyone willing to listen that things are bigger and better in Texas. Meanwhile, our humility reminds us that while Texas is blessed with bountiful natural resources, those resources will not always last. While time is on our side, and before the oil fortunes of today mirror those of the 1980s, we have a unique opportunity. By creating a two-tier approach to the ESF — setting 8 percent aside and using investment income from the rest for long-term needs — we can leave future generations with a Texas-sized inheritance and another reason to boast that things are always bigger and better in the Lone Star State.